2) update you on what’s been happening since the end of May. FUNDRAISING: We had a marvelous initial outpouring of generosity from those of you who had the opportunity to hear and meet Daoud as he made his presentations around the country. People who have taken the initiative to visit the land through IFPB tours and see the situation firsthand have been very responsive. However, as you know from the ongoing onslaught of solicitations from any worthy cause you have ever given even $10 to, it is difficult to choose which ones to support on an ongoing basis. We only ask that you keep this in mind: Every dime you donate goes to support Tent of Nations. Any administrative costs, and there were some, of course, were for startup of FOTONNA and other ongoing expenses (website, non-profit application, brochure/flier/article copies, postage, air fare, etc.). The Steering Committee, of course, is all-volunteer; no one is paid for his or her work, and we have made most of our personal expenses as in-kind donations. So far we have raised almost $50,000. Our goal for the first year has been closer to $100,000. As you can see, we have come up a bit short. Our hope, and expectation, is that those of you with personal ties to the Nassar family and who know their story firsthand will dig a little deeper, find that $10 or $25 or $5,000 in your back pocket, and will send off your check as soon as possible. It will enable you to continue your commitment to change in the area – have a real impact on the lives of people you know – keep you in touch with friends whose lives you have touched, and whose lives have touched you. We also hope that you can go to your church or mosque or synagogue and ask for some support from one of your outreach committees. If ten groups could give $1,000 each, that’s $10,000 more towards working for peace with justice in the Middle East. If you are a believer in small miracles, then you know that the work done at Tent of Nations has a ripple effect far beyond the boundaries of that 100-acre farm. Sometimes miracles, however, need a boost from the realists in this world. Please be a part of that boost; we promise that every dime will be well spent! HOW CAN WE HELP YOU HELP TENT OF NATIONS? If you have visited the farm, you have a compelling story to tell, and we are here to help you tell that story. We will send you aFundraiser Kit that includes: DVD that tells the Nassar story from on-site at the farm; brochures explaining what FOTONNA is all about; maps; Newsletter copies; donation forms; relevant articles; sign-in/sign-up sheets; business cards; and, anything else you can think of that would help you with a formal presentation on behalf of FOTONNA and Tent of Nations. We have depended heavily on Daoud’s and Jihan’s visits to tell their story; however, we need YOU to help take on some of this responsibility and lighten their load a bit. To learn more about us, please go to: www.fotonna.org. Please consider becoming a Fundraiser for FOTONNA, enabling us to support the Nassar family through its struggle to continue the work of Tent of Nations. Please contact Kay Plitt at kay@fotonna.org with questions or to request a Fundraiser Kit. If you are already a Member and can support FOTONNA with an additional donation, or if you want to become a New Member, simply use the Donation Form found at the end of the Newsletter. It is very easy to become a part of a growing movement that will provide so much personal satisfaction as you watch the seeds of peace grow – and grow – and grow. UPDATE: To keep you updated on events since May, we need to start with Daoud and Jihan Nassar’s whirlwind June ’08 tour.This was Jihan’s first trip abroad without the three Nassar children, and it was an emotionally difficult thing for her to leave them behind. Daoud’s mother kept watch over the young ones in Bethlehem, and there was daily communication going on, but it was a real sacrifice on Jihan’s part to accompany Daoud on this trip. And, that is why Jihan’s presence made this tour a special event. Even in light of the sacrifice, she never missed a beat. She presented her own story to people in DC, Virginia, Maryland and Ohio; she moved people through both laughter and tears. Her work with the women of Nahalin came to life through her own words and emotions, and you could tell how dedicated she is to helping these women improve their lives through learning computer skills and English, having discussions on women’s health issues, creating works of art through their needlework, and just being there to listen to their concerns and worries. As she told her stories, it was clear that she needs support for these projects, especially as she would love to expand the scope of the programs to include the women from the other four Muslim villages in the vicinity of the family farm. She needs volunteers, materials, a market for the truly beautiful products they create, computers, etc. They need a larger building to house the programs, and would love to be able to purchase rather than rent, as they now do. As you know, it costs about $200 per woman for a three-month course. They had so many women interested in attending, they were able to double the number of classes offered. Jihan wants to help these women produce quilts and introduce weaving techniques as well. She picked up new ideas everywhere she went; her creative mind never stopped working overtime! We want each of you reading this to seriously consider giving as much support as possible to this dynamic woman who never stops working and plays so many roles. Dig deep – see what you can do! Can your church sponsor an alternative gifts project for Christmas? Can you spend a month or two on the land teaching English or computer skills or weaving or quilting skills? Can you help teach them how to produce wind chimes, clay pottery? What gifts do you have to share with these wonderful people? Jihan may be ‘superwoman,’ but even she can’t do it all alone! Let us know what you can do to help by writing to: kay@fotonna.org. As always, Daoud presented his family’s story with a determination to have people hear the truth about what’s happening on the ground. Most of you reading this have heard this story, but you may not know how difficult it was for them to get here. Here are some of the facts: It took them over three days to get from Bethlehem to Amman and on a plane to New York; they had to go through three checkpoints and were never certain if they could continue through or would be turned back; uncertainty gnawed at them every step of the way; they had to spend an extra night in NYC because their first flight was cancelled and they got in 12 hours later than planned; and, of course, most of this was repeated on their way home. In addition to this difficult trek, they carried the weight of an extra concern with them. A week or so before they made their trip, armed settlers arrived at their front gate and threatened to bulldoze the Tent of Nations tent, the shaded pen set up for the livestock, and other small structures used for their work. The message was: If we want to, we will come in, bulldoze it all down, and hand you the bill for the work. The Nassars, of course, dealt with this issue with poise and nonviolent means. It doesn’t mean it was easy, however. How much longer must they tolerate this situation? While in Ohio, DC, Maryland and Virginia, Jihan and Daoud were sponsored by a number of people, and it is essential to acknowledge those supporters. Special thanks go to Mike and Judy White, of Ashland, Ohio, for coordinating the Ohio portion of the trip. They were helped by Samir and Marlene Mourad, Jeff Abood, Liz Lavelle, Sr. Marilyn Nichols, Pastor Mark Oster, Linda Gotthardt, Alan Federman, Doug and Mary Ann Kerr, Dr. Kevan Franklin, John Stratton, Pat O’Bryan and Jane Dinda. John and Ann Loikow sponsored an evening at their home in Washington, Pastor Chris Looker and Suzie Ennis organized an event at Annandale First Presbyterian Church, and Steve France and Jim and Carlotta Anderson set up the Glen Echo Town Hall for a presentation. People were generous with their donations, and each and every effort was appreciated by the Nassars. The goal of educating more and more people about the situation at Daher’s Vineyard was met quite impressively. Daoud and Jihan spoke with representatives from the offices of several Congressmen, including Representatives Jim Moran, Dennis Kucinich and Chris Van Hollen and Senator Jim Webb. Representative Jim Moran signed and forwarded a letter that we drafted to Condi Rice asking that the situation be looked into. Letters from every one of you could help educate your senators and representatives about the situation and maybe open up a few minds and souls to the realities on the ground. Every little bit helps! Cistern – FOTONNA’s one-time-only drive to help the Nassars purchase a good used backhoe to meet this urgent need has met with some success. 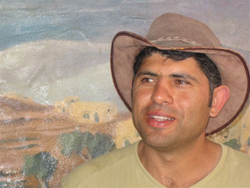 We have received $7,500 to match the dollar-for-dollar offer, but Daoud hasn’t been able to find a backhoe that he can purchase and get onto the land. There was some short-term diversion of money in order to purchase a very large portable water tank, however, that they are using to purchase water from Nahalin and transport to their own cistern. Waterfall was very scant this past rainy season for everyone, and this essential element is in great need right now. (Please read the article at the end of the Newsletter for more information on the severity of this issue.) The search for a backhoe is still in progress, and we thank everyone who helped support this request. As always, though, more dollars for water purchases are needed, so…. 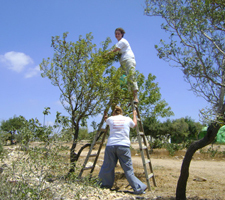 Olive Trees – Daoud said they were able to plant an additional 600 young olive trees through your donations and the work of volunteers from around the globe. 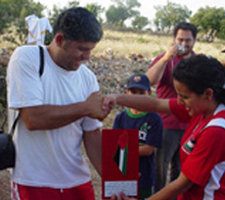 Planting trees is a powerful sign that there is still hope for peace and justice as Palestinians, Israelis, and internationals are brought together with a common goal. Every $10 sponsors one tree. Summer Youth Camps – The Children’s Music and Arts Festival was a resounding success! 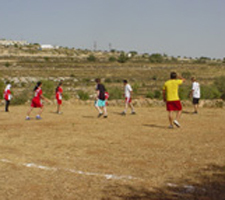 Children from the neighboring villages, Bethlehem, the West Bank and ten other countries were there, and volunteers in the arts from Europe and the US participated in this exciting event. Two of the projects that came out of the activities include a booklet of pictures and stories the children wrote, and post cards using some of the pictures taken will be produced for sale. In addition to visits to the United States, Daoud went on tour to Zurich, Amsterdam and the UK in August/September in an attempt to set up Friends of… projects in those places. The more support he has internationally, the better off Daher’s Vineyard is. We will update you in the next newsletter.For more details and pictures, please go to www.tentofnations.org. Finally, Daoud Nassar will be in the United States again for an October/November Tour! FOTONNA will be sponsoring this trip, along with financial support from several other organizations; this will be an educational/ fundraising tour. He will be making the following presentations in the DC/VA/MD area: 1) October 16 at *Busboys and Poets, Shirlington, VA, at 8:00 PM (will have some poetry readings as well as getting updates from Daoud); and 2) October 19 at Bradley Hills Presbyterian Church, Bethesda, MD, from Noon-1:00 PM. There will be presentations in the San Francisco/South Bay area (TBA – see website for details) October 28-31. The Tree of Life Conference, to be held in Old Lyme, CT, will host Daoud on November 2, and there will be other smaller events in Centerville, MA on November 3, and 4. More specific dates and places will be announced on the website (www.fotonna.org). We hope that if you live in one of the areas where presentations will be taking place that you will make every effort to attend! *Reservations for this event must be made in advance; cost is $15 per ticket to be paid at the door. Email Kay Plitt atkay@fotonna.org by October 10 if you would like to attend. Seating is limited to the first 60 people to respond. We are encouraging everyone to come early to have dinner at BB&P as we will only be serving dessert and drinks. Click here to download the donation form to mail. Bethlehem – Ma’an – A coalition of Palestinian and international NGOs issued a statement on Friday calling the water shortage across the West Bank a “humanitarian crisis” and said they were “gravely concerned.” The coalition said that there was a reduction in water supplies from rainfall averaging 45% across the West Bank, which has left 200 communities not served by the municipal water sources at a loss. 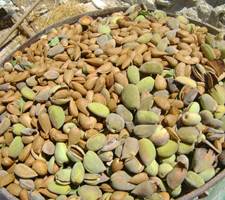 There is not enough water for cooking, cleaning, agricultural irrigation, or basic food-producing plant watering. Even in cities and villages connected to water mains, reduction in supply means frequent cut offs for homes and offices. It is common in many areas to not have water for a week, and others only receive water once in a fortnight. Several aid organizations have been providing emergency water resources so the basic needs to Palestinians can be met. The coalition, however, said it doubted whether even with the emergency support, that all basic needs would be met. The group said that unless Israel increases the current water supply to the area, health and hygiene, crops and fruit trees would suffer. When wells dry up or water mains stay shut for long periods of time, homes and businesses regularly turn to water tanker services to fill the gaps in service. Most buildings have several water canisters on their roofs, used to store water when lines are full. The tanks are filled up by water tanker services, but cost 30-40% more than the municipal service. For one tank of water (10 square meters), residents pay around 250 shekels, which will provide water for five homes, which lasts a family anywhere from 2-6 days. Even when families can buy water, tankers often have to travel long distances to wells or “filling points.” Many of these are obstructed by Israeli military checkpoints, or physical obstacles like mounds of earth piled onto roads near the wells, or concrete blocks placed by the Israeli army to prevent traffic on a given route. As a result, tankers have to travel circuitous routes to get to the wells, using more gas and time, and ultimately costing the customer more. Many West Bankers spend between 3-5% of their monthly income on water, and more when families depend on crops and livestock for their livelihoods. The organizations in the coalition issued a call for the international community to respond with funds and aid for immediate relief, and the long term building of more wells and filling points for communities off the municipal grids. The group also called on Israel to issue permits for the construction of such wells, and immediately increase the amount of water West Bankers have access too. Finally, they called on the Israeli and Palestinian governments to come to an equitable decision on the sharing of water resources so that catastrophe and humanitarian crises can be avoided in the future. PARC – Agricultural Development Association, PREMIERE URGENCE, G.V.C – Gruppo di Volontariato Civile, LifeSource, Palestinian Hydrology Group, Centre on Housing Rights and Eviction, The Applied Research Institute-Jerusalem, The Swedish Cooperative Centre, Palestine Farmer Union. Oxfam International, and Asemblea de Cooperacion Por la Paz. Dear Friends, We are glad to see the work of the Tent of Nations growing and bearing fruits. We want the Tent of Nations to be a light and a sign of hope for the ones who are losing their hope for a better future. It is wonderful to have Friends of Tent of Nations who are sharing the same vision with us and supporting the work we are doing. Thank you for your support, for keeping the spirit of the Tent of Nations high and for keeping hope alive. It is a big encouragement for the Tent of Nations to feel the support of people all over the world. Thank you all for this solidarity.